Are you hoping to completely transform your space and improve its function or appearance? 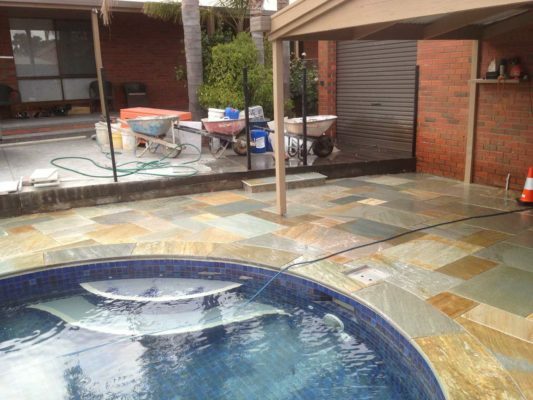 Here at BlueStone Landscape Construction, we specialise in natural stone paving in Bendigo that is ideal for a wide range of applications. Whether you simply want to improve your front lawn with a quality driveway and path, would like to create your own backyard entertainment areas or simply pave around your pool, we have the perfect solution for you. We have a range of options available to our clients to suit your space, your taste and your budget. As our landscape team specialises in natural stone paving, we often work with granite, travertine, sandstone, slate and more. We have extensive experience in all aspects of paving services and can ensure that your project is completed to the highest standard. As well as the choice of a great selection of pavers and colours, we offer our clients a range of patterns in terms of how you want them to be laid. This allows you to create a unique space that you will absolutely love. Pavers can be laid on crushed rock and sand or a concrete base with a wet mortar mix. Our outdoor stone pavers have extensive experience doing what they do, and have the skill and the attention to detail to create some truly stunning finished products. No matter the size of your project, whether big or small, our landscape team will provide a consistently high standard of craftsmanship and care when it comes to your stone paving. If you wanted to get an idea of how paving can really improve your space and to see the high level of work you can expect from our experienced team, please head to our photo gallery. If you would like to speak to our team about paving or Bobcat services or were interested in requesting a quote for your property, please get in touch with us today. Reach us on 0400 078 913.